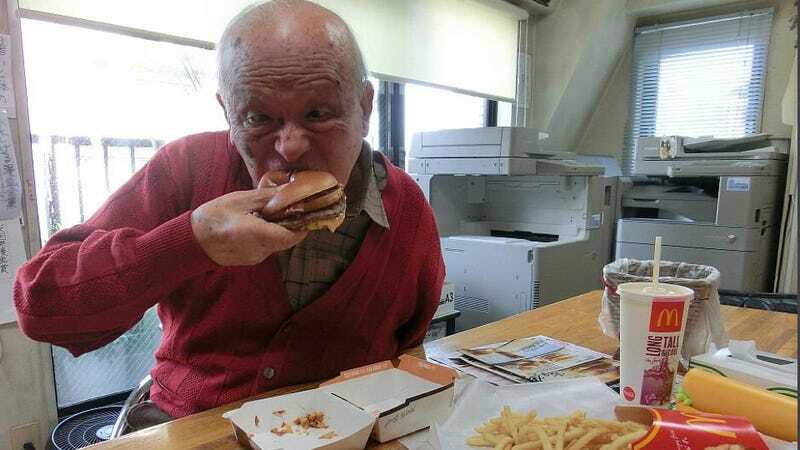 One of Japan's Greatest (and Oldest) Manga Artists, Eating a McDonald's Hamburger. Shigeru Mizuki is best known as the creator of GeGeGe no Kitaro. Before becoming a famous manga artist, he survived serving in World War II, catching malaria and having his arm blown off. Now at a spritely 90 years old, he's eating burgers. Good for him! Usually, greasy fast food might be rough on elderly people's stomachs—and the stereotype in Japan is that old people really don't like hamburgers. But Mizuki seems to be enjoying this McDonald's "Texas Burger." Heck, the entire Twitter feed for Mizuki's production company is him eating burgers and Japanese sweets, as well as working.